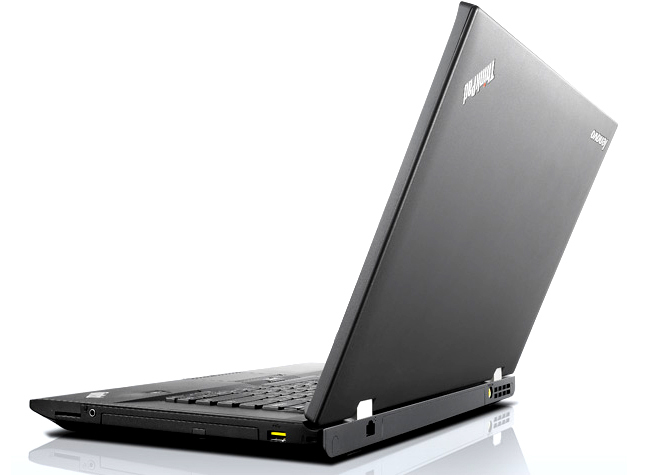 Business customers have long used the Lenovo, formerly IBM, ThinkPad family of high-end business laptops. A few years ago, Lenovo created the ThinkPad L series to add a stepped down, more affordable line of notebooks to attract a larger target group. This idea seems to have been successful as the L series has been a continuous part of Lenovo’s portfolio and is constantly updated with the latest technologies. 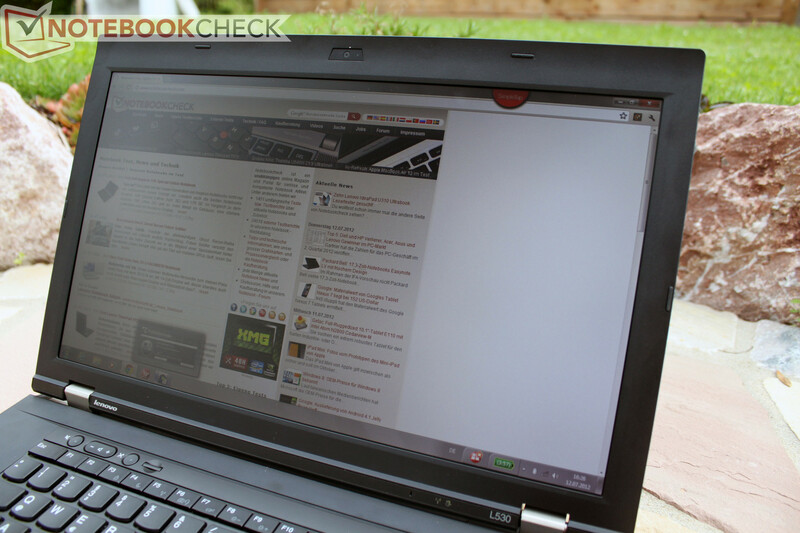 One year ago, we reviewed the ThinkPad L520. 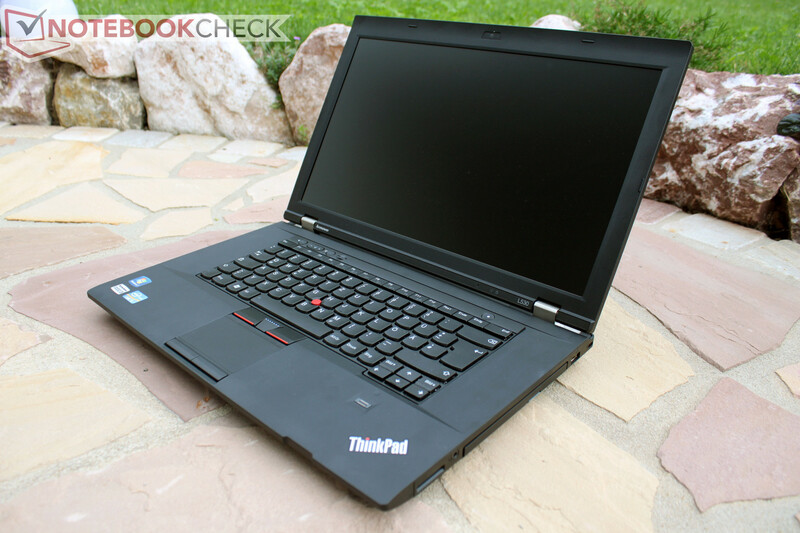 In this review, we will consider its successor, the Lenovo ThinkPad L530. In the past year, the notebook sector of personal computing has seen a lot of innovations and improvements. The most striking example of this is the Intel Ivy Bridge platform used by the ThinkPad L530. As well, Lenovo has refreshed the case for the L530 and the most prominent change is likely the new chiclet-style keyboard. Despite some users’ reluctance to embrace the keyboard change, all new ThinkPad models now use this new keyboard style. The updated ThinkPad L530 comes available in multiple different configurations, ranging in price from 730 to 1000 Euro ($890 to $1220 USD). The price reduction for the ThinkPad L series is due in part to Lenovo’s choice of case materials. 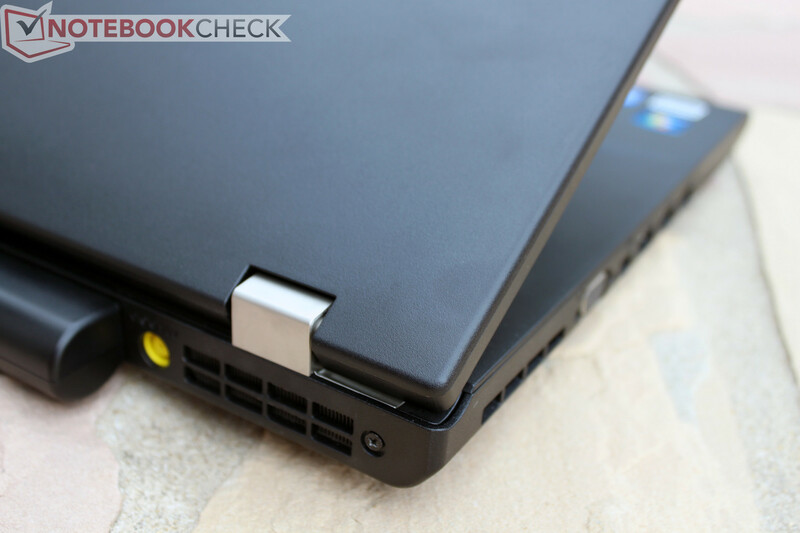 Most low-end laptops, regardless of whether they are intended for consumer or business targets, use plastic shell cases and Lenovo’s ThinkPad family is no exception. 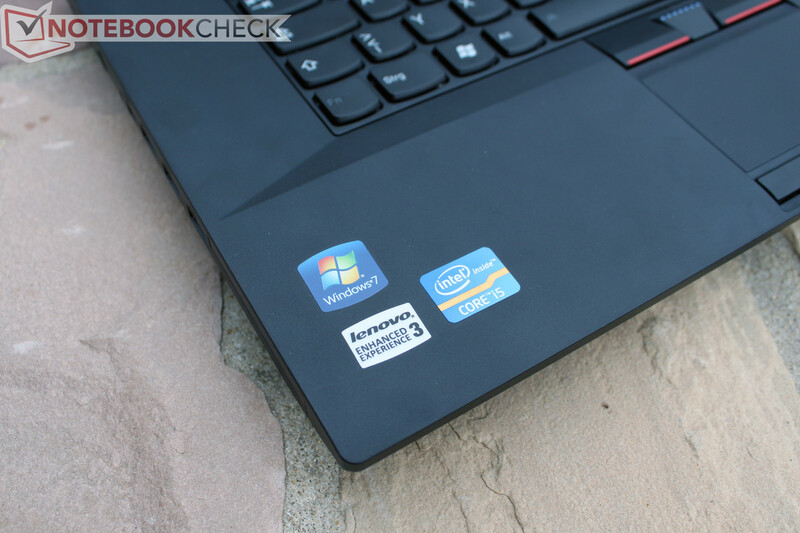 Nonetheless, the ThinkPad L530 is superior when compared to most budget consumer notebooks. The case defies selective pressure well and twisting is not an issue for the base unit. The subjective feel of the laptop is pleasantly soft. 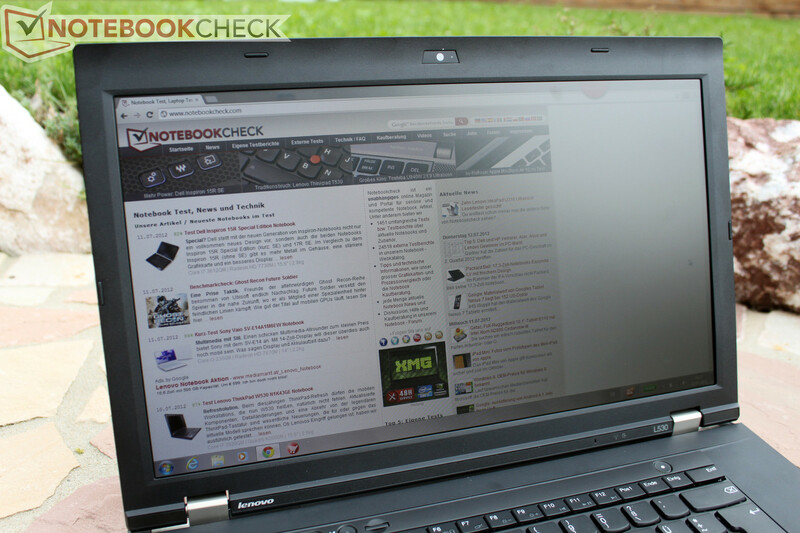 Unfortunately, the ThinkPad L530 does not give the user a high-end feel when handling the notebook. 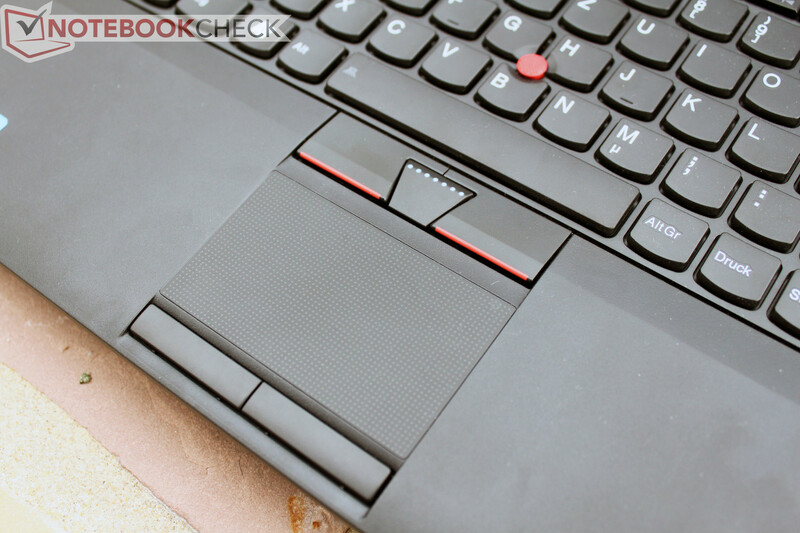 For many years, the ThinkPad family has used massive metal hinges and a red TrackPoint pointing stick device as trademarks and the ThinkPad L530 does not break with tradition. The hinges do well to keep the screen in place and stable with a maximum opening angle of over 180o. 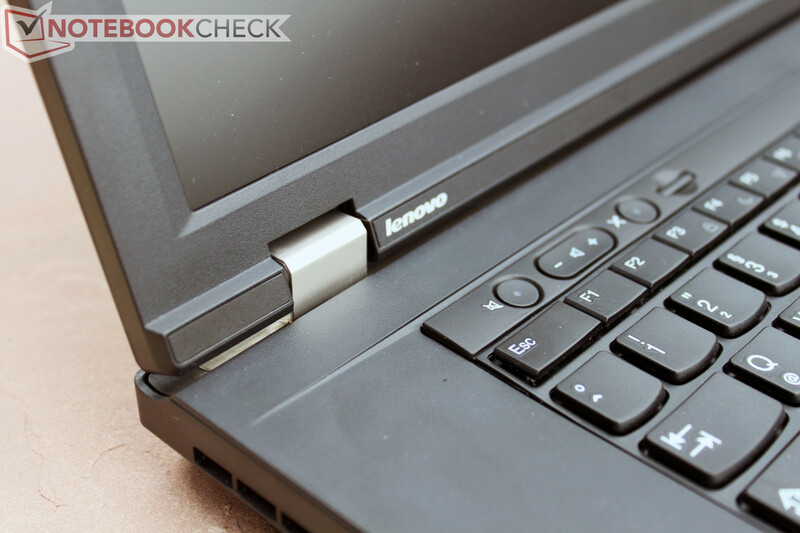 The L530 lacks a display latch as Lenovo has not used one in its designs for several product cycles. Often times, costs can be reduced by scaling back connectivity options. The ThinkPad L530 avoids this philosophy and we found that the included ports are quite acceptable. 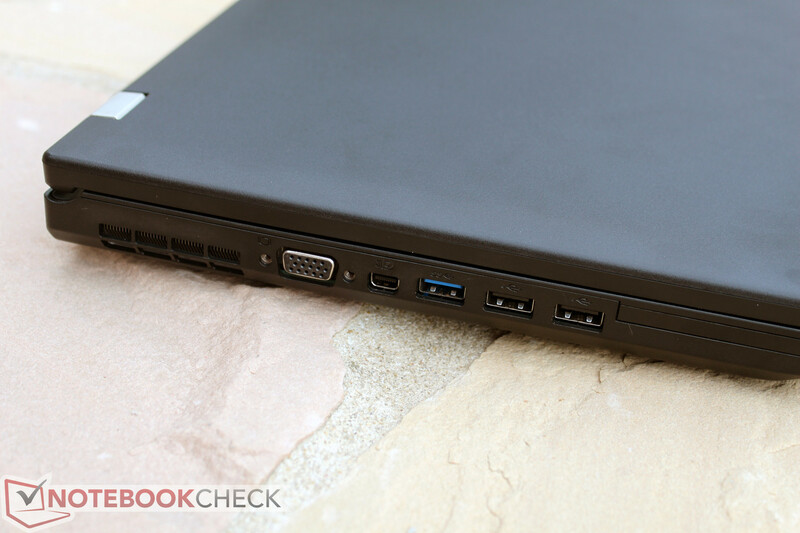 The notebook has four USB ports, one of which is the faster USB 3.0. Another of the ports is a permanently powered USB port that can be used for charging portable devices via USB even when the notebook is shut down. External video support is handled by a VGA port and a mini DisplayPort interface. The docking port on the notebook’s underside can be used to expand the number of ports should the included ports be insufficient or if the user simply wishes to reroute cables from the sides of the notebook or simply conceal them from view. On a positive note, Lenovo has not updated the Series 3 replicator so anyone who already owns the docking system for the previous model can likely continue to use it. The L series lacks the modular ultra-bay slot available in more expensive ThinkPad models. 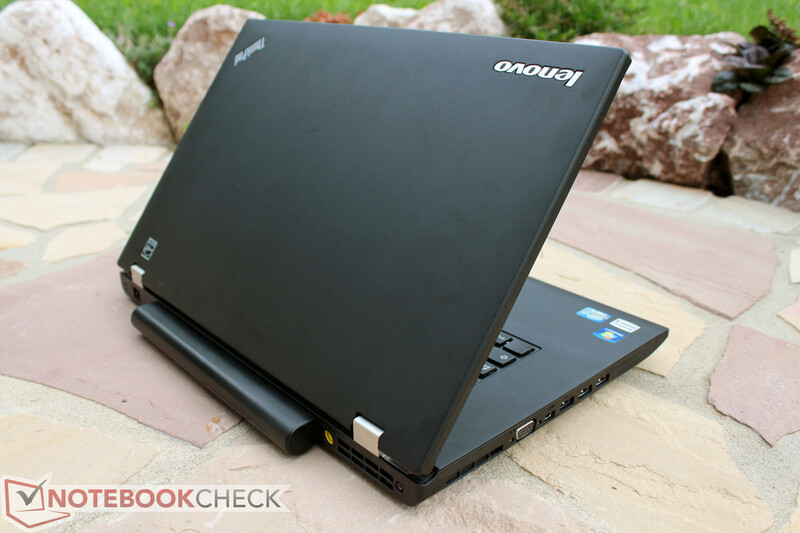 As is typically the case, other accessories can be found from Lenovo’s online store. The ThinkPad L530 features state-of-the-art communications interfaces. Gigabit Ethernet capable of 10, 100, and 1000 Mbit/sec transfer speeds and the Intel Centrino Advanced-N 6205 Wireless LAN card provide network connectivity. Bluetooth 4.0, the latest Bluetooth version, is also part of the notebook’s standard equipment. The ThinkPad L530 can also be configured to include an optional WWAN (mobile broadband) module. 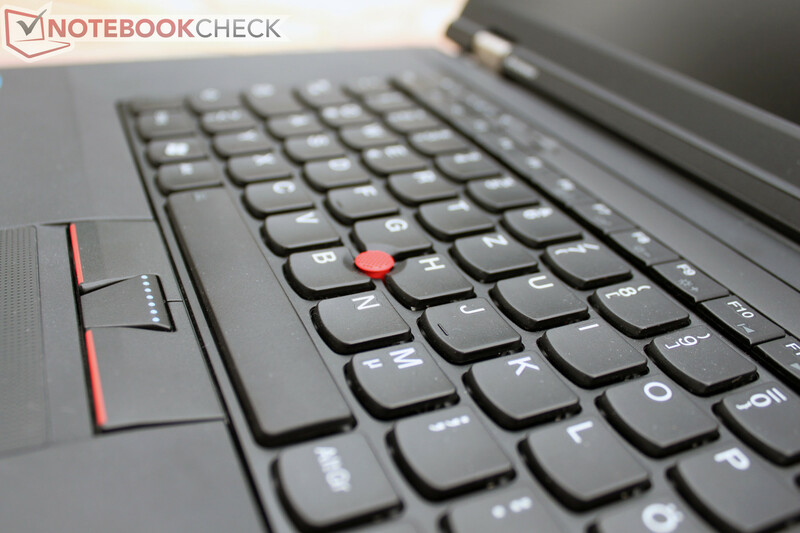 As a business notebook, the ThinkPad L530 comes with a fingerprint scanner and integrated TPM (Trusted Platform Module). The notebook can also be configured to include an optional SmartCard reader and a 54 mm ExpressCard reader. Our test system has the former but not the latter. A maintenance cover on the underside of the ThinkPad L530 allows access to an unoccupied RAM slot, the hard disk, and a mini PCI slot which has the necessary wires for installing a UMTS modem. As there is only one such slot, the installation of an mSATA SSD precludes the option for the UMTS module. Our L530 test sample came with a slim 7 mm hard disk but it should be possible to use conventional 10 mm hard drives as well. The manufacturer’s warranty starts at 12 months for this entry-level device and can be extended. Our higher-level configuration includes a three year warranty with on-site service. A five year on-site service warranty is also possible for a reasonable 199 Euro ($240 USD) premium. From our experience, on-site service warranties are essential for work devices that are critical for daily operation. Choosing the proper warranty to fit the planned duration of use is important as a remaining warranty often increases resale value. After reviewing the Lenovo ThinkPad T530 and the new W530 workstation, we are quite familiar with Lenovo’s new Chiclet-style keyboard. 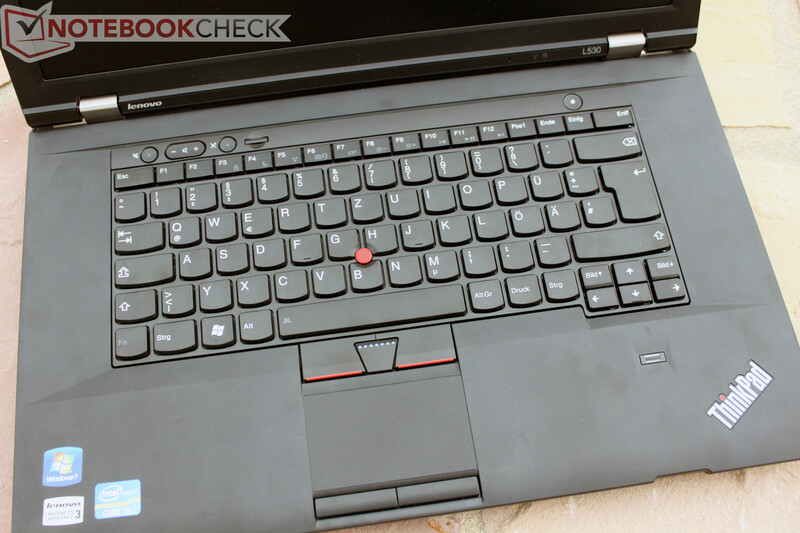 The L530 uses the same keyboard as the higher-end T530 and W530 but lacks the backlight. The typing feel is amazingly good for a chiclet-style keyboard. The key drop is generous and the pressure point is also clearly perceived. Lenovo has obviously invested a significant amount of time to develop a keyboard that provides optimal typing comfort despite the chiclet-style. Nonetheless, those switching from a classic style Lenovo or IBM keyboard will require a period of familiarization. The combination touchpad/TrackPoint system is also identical to those of previous models and the user is given a familiar experience. Unfortunately, our test device exhibited major problems with the touchpad’s responsiveness. We assume that this issue is limited to our particular unit as the identical touchpad in previously tested models worked flawlessly. For the lower-priced L series, Lenovo provides two options for display. The standard option is a conventional HD WXGA display while a 1600x900 HD+ screen is available for a small premium. Our test device featured the HD+ screen. 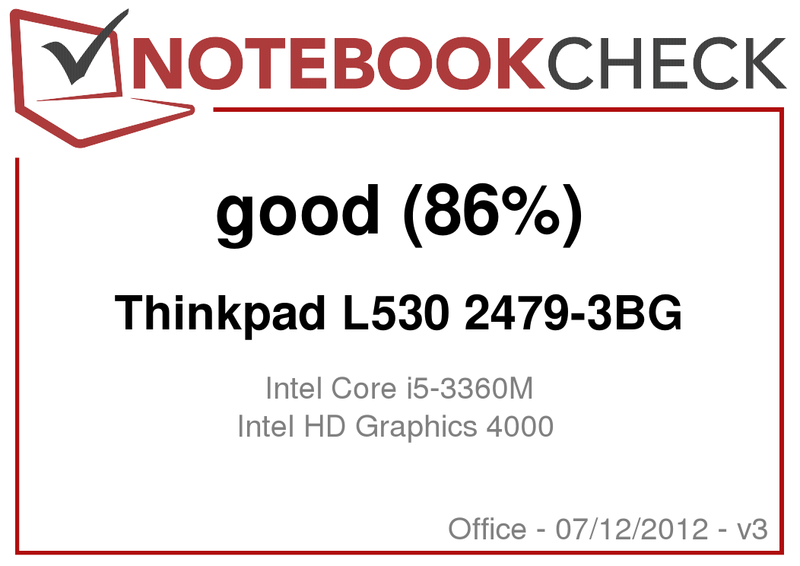 Based on the comparable model numbers of the L, T, and W series notebooks, one might be inclined to assume that the display in the L530 is the same as in the recently reviewed T530. However, the display has a different model number. In our tests, we observed a lower average brightness of 197 cd/m2 but comparable maximum contrast of 726:1 when compared to the T530’s display. Illumination was also comparable to the T530’s counterpart. Due to the uniform illumination, high contrast, and matte screen, the ThinkPad L530 even surpasses most current multimedia notebooks. The virtual lack of reflections allows the display to be used outdoors, even if the display could use a bit more brightness. We found the viewing angles to be acceptable for an office device. As usual, larger deviations from the ideal, head-on perpendicular viewing angle are possible but image distortions appear quicker in the vertical axis. 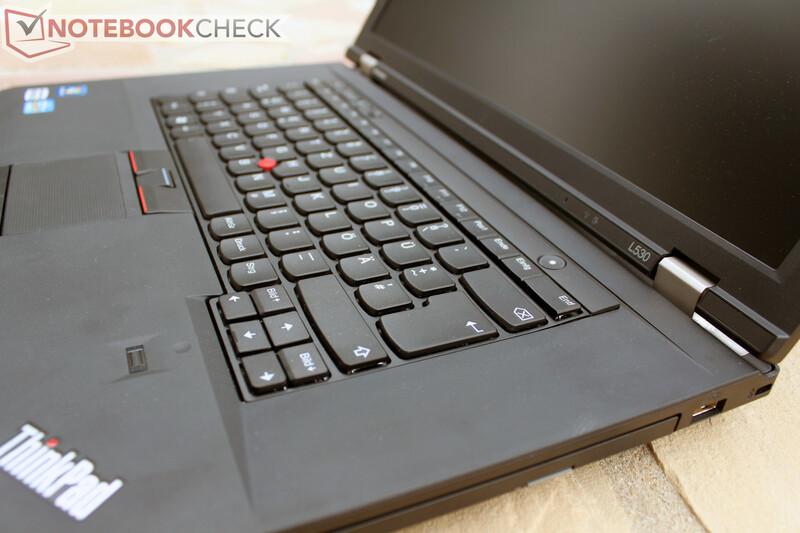 As a business notebook, the ThinkPad L530 can be configured with one of many different CPUs. The range of possible CPUs starts with the Intel Celeron 815 and gradually increases in performance and cost, including the Sandy Bridge i3-2370M, and Ivy Bridge i5-3210M and i7-3520M processors amongst others. Despite the array of options, all CPUs are dual-core processors and no quad-core options are available. The standard graphics solution for the L530 is the processor-integrated Intel HD Graphics card. Our test sample, which uses an Ivy Bridge processor, features the Intel HD Graphics 4000. 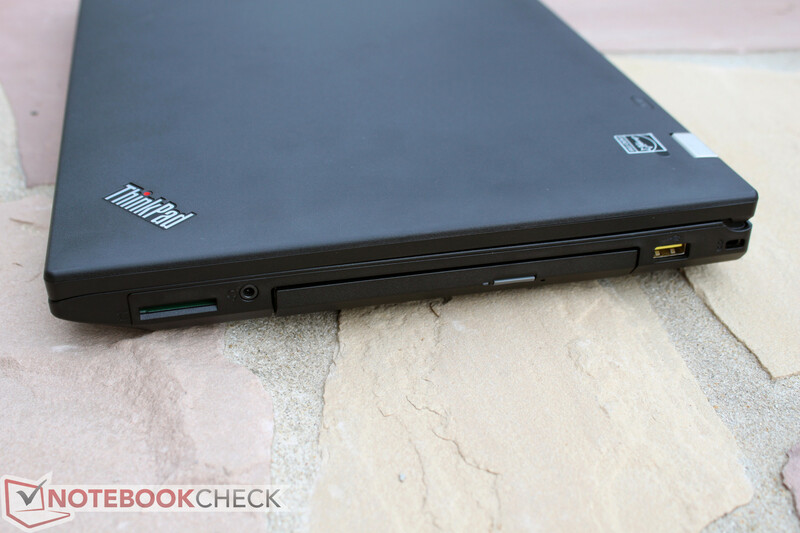 Additionally, the Nvidia’s NVS 5400M featured in our ThinkPad T530 review is also an option. The ThinkPad L530 comes with up to 8 GB of RAM. The options for storage device include 5400 and 7200 rpm conventional hard disks and solid state drives up to 256 GB in size. Our sample model has a premium equipment configuration designed for office use and includes the Intel Core i5-3360M processor, the integrated HD Graphics 4000, a 500 GB hard drive, and 8 GB RAM. 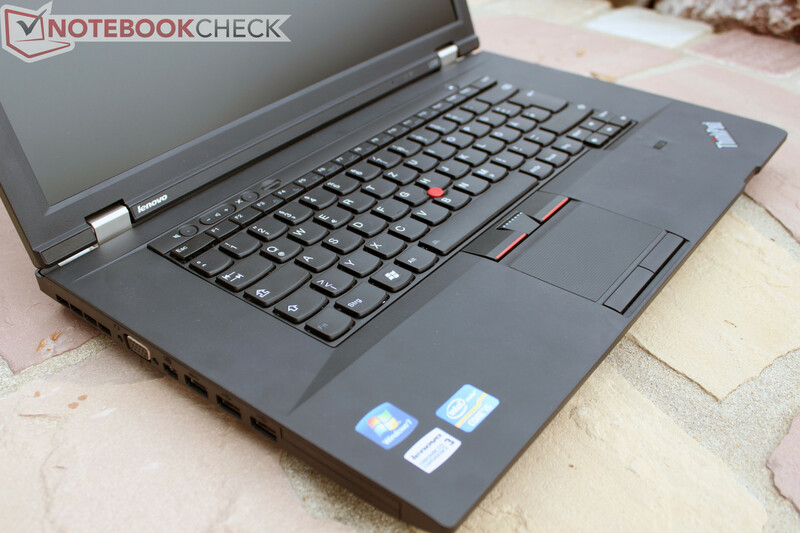 Our test ThinkPad L530 features an i5-3360M processor. In Cinebench R11.5, our CPU scored 3.24 points in the multi-core test. 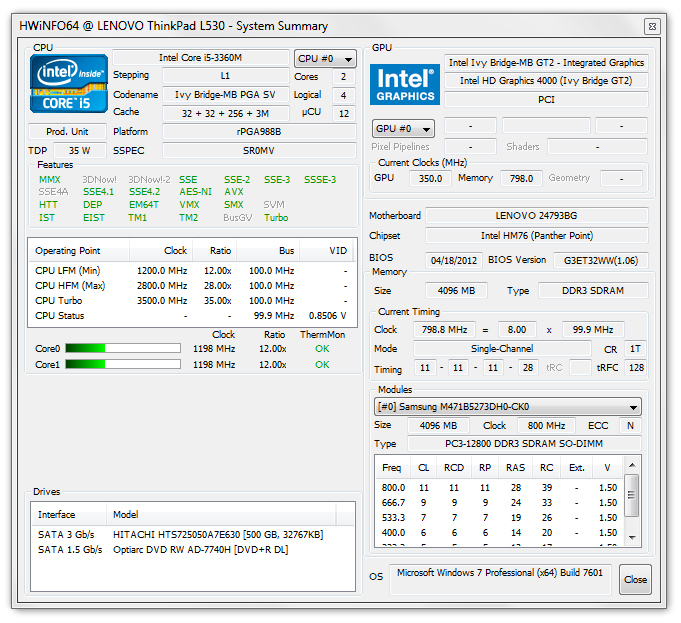 This result places the i5-3360M at the upper end of dual-core processors. Nonetheless the dual-core processor lags behind newer quad-core CPUs. Using our benchmark database, we can estimate that our test configuration lags behind the maximum L530 configuration, featuring an i7-3520 CPU, by about 5 percent in the Cinebench test. The i5-3210M CPU installed in many pre-configured L530 models lags behind our i5-3360M by about 12 percent. The gap between our i5-3360M and the older Sandy Bridge i5-2370M is about 30 percent. By comparison, the Celeron 815 CPU is the epitome of entry model and lags 60 to 70 percent behind our i5-3360M. Based on the price points of the various processors, the i5-3210M CPU is the best choice for average, low load office tasks. As it is low-priced but still includes the Intel HD Graphics 4000 integrated GPU, it provides a considerable boost over the i5-2370M and its HD Graphics 3000 even if the pure CPU differences are negligible. For more specialized, computation-heavy programs, the i5-3360M and i5-3520M are more suitable. For testing the overall system configuration, we used the PCMark 7 benchmark. Our test configuration scored 2842 points which places it in a similar position to the ThinkPad X230 and T530, both featuring similar equipment and no SSD storage device. Using an SSD would significantly boost the score and could very well be worthwhile for performance-oriented users. 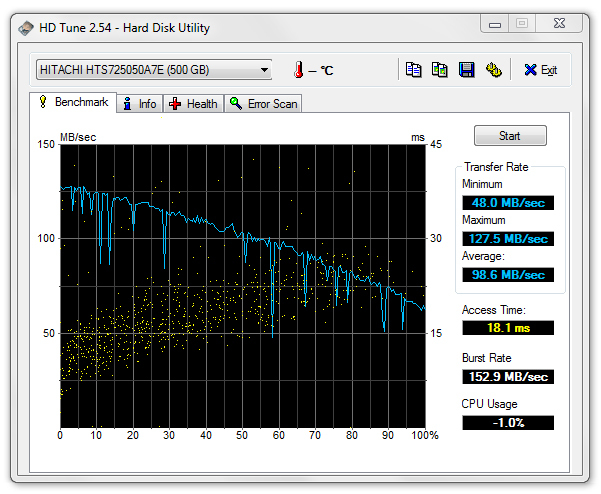 Our ThinkPad L530 uses the 500 GB 7200 rpm Hitachi HTS725050A7E. This is one of the fastest drives of its class and we recorded a remarkable average transfer rate of 98.6 MB/s in the HDTune benchmark program. The measured access speed of 18.1 milliseconds is average. While these results are good, a solid state drive would not only improve benchmark results but the system’s overall speed would demonstrate a subjectively significant increase. Boot and load times could both be clearly reduced and the user would benefit from a silent, energy-efficient storage device. The integrated HD Graphics 4000 is designed to provide the minimum required performance for office use. Nonetheless, one should not underestimate the power of the graphics solution. Multimedia and video playback or simple games can easily be handled by this GPU. In 3DMark Vantage, our ThinkPad L530 placed itself below similarly equipped notebooks. Compared to dedicated graphics cards, our HD Graphics 4000 performs at the same level of the older AMD HD 5650M and GeForce GT 335M midrange graphics cards. In the previous section, we mentioned that the Intel HD Graphics 4000 is capable of limited gaming. This should be accepted with a measure of proportionality. We briefly tested the recent Anno 2070 and recorded a mere 19.3 fps in medium details at 1366x768 and only 13.0 fps at high settings at the same resolution. These results are too low for enjoyable game play, even for a leisurely-paced game such as Anno 2070. Consequently, recent games will require graphical detail and resolution reductions to achieve smooth frame rates. Nonetheless, the HD Graphics 4000 is capable of quite a bit due to its DirectX 11 support. The screen’s native resolution is unlikely in current games though, due to performance limitations. For more information, please consult our extensive mobile graphics card benchmark database. In routine office tasks such as browsing the internet and using Microsoft Word, we observed a pleasantly quiet device. For the most part, the fan remained disabled and the only noise came from the hard disk’s quiet whir. With an SSD, the ThinkPad L530 would be absolutely silent in this scenario. Even when the fan started during short peak loads, the ThinkPad remained quietly in the background with a noise level of 32.8 dB(A). In our practical stress test, we stressed both the CPU and GPU under full load for a longer period of time. In our test, we were able to attain the fan’s maximum speed and observed a clearly audible 37.8 dB(A) noise level. However, this state is unlikely to ever be reached in routine, practical use. Despite its low speed, the fan was capable of aerating the large case. We measured maximum temperatures of just over 30oC and 40oC (86oF and 104oF) on the base unit’s top and underside respectively. The temperature stayed more or less constant when the fan started and operated at maximum speed in our stress test. However, we observed that a hotspot moved from the fan’s front to the rear on the underside. Continuous lap-top use of the notebook should always be possible without issue. (+) The average temperature for the upper side under maximal load is 27.5 °C / 82 F, compared to the average of 29.4 °C / 85 F for the devices in the class Office. (+) In idle usage, the average temperature for the upper side is 30.3 °C / 87 F, compared to the device average of 29.4 °C / 85 F.
The ThinkPad L530’s two speakers did not make a strong impression. As they are placed on the notebook’s front edge, they operate by reflecting sound off whatever surface the L530 rests on. We found the speakers’ sound to be tinny and thin without using the included Dolby software. While the Dolby equalizer compensated for a lot, the sound remained restrained and muffled. The maximum volume should be better, perhaps 50 percent higher. While our Lenovo ThinkPad L530 was idle, we observed a power consumption of between 8.8 Watts and 13.9 Watts, within the expected consumption range considering the notebook’s equipment. During our stress test, we observed a maximum power consumption of 56.8 Watts, a result that is also typical for Ivy Bridge dual-core CPUs. The included 65 Watt power supply handles even peak loads adequately. In the past, Lenovo offered both a 6 cell battery that lays flush with the case and an optional 9 cell battery with a 94 Wh capacity for those requiring longer mobile runtimes. 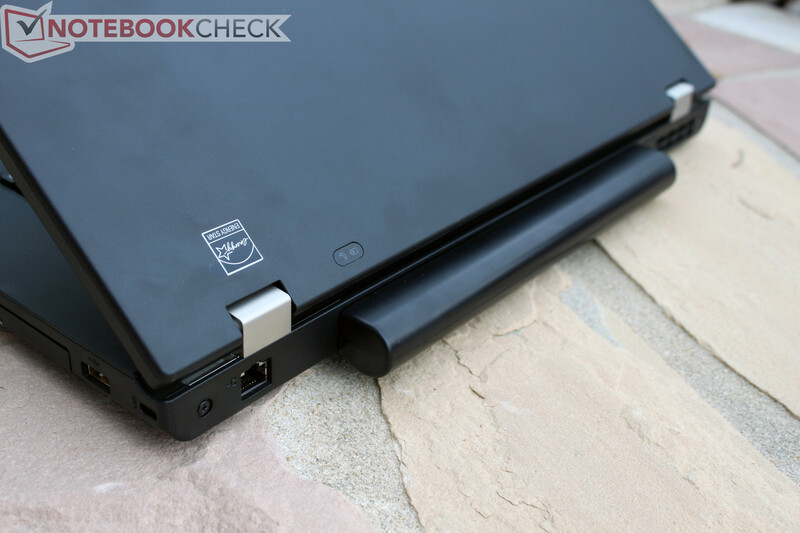 This remains the case for the ThinkPad L530 and our test device came with the latter. When purchased separately, the 6 cell and 9 cell batteries cost 40 and 130 Euro ($49 and $159) respectively. In the practical Wi-Fi runtime test, using energy saving mode and an approximate 150 cd/m2 brightness, we observed a very good runtime of 7 hours and 10 minutes. By comparison, the 6 cell battery and its 57 Wh capacity would result in a runtime approximately 30 percent shorter. Based on our testing and experiences with the ThinkPad L530, we found that the differences between the L530 and the more expensive ThinkPad T530 are fewer than expected. The obvious difference is the case where the L530 uses only plastic. While it does not provide a high-end feel, the case nonetheless offers good stability. The USB 3.0 and mini DisplayPort connectivity make a docking station nearly superfluous. 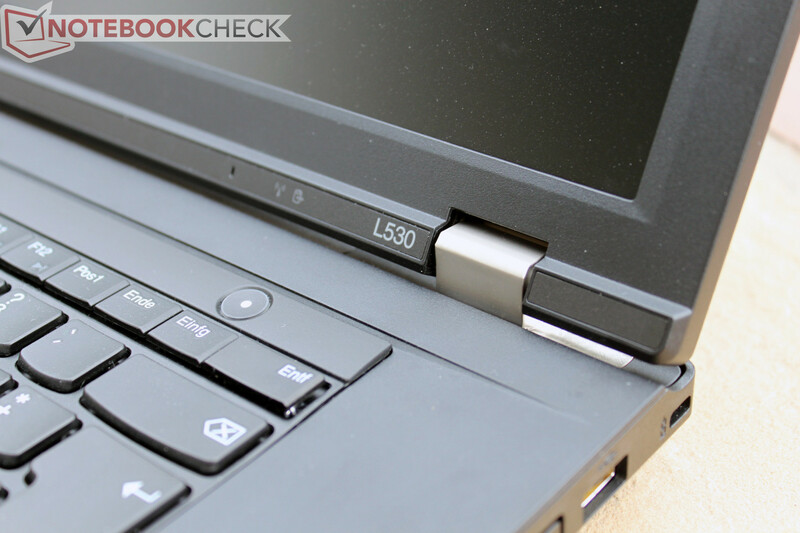 Nonetheless, the ThinkPad L530 receives bonus points due to the corresponding port. The L530 uses the same input devices as its more expensive siblings. The input devices are worthy of a ThinkPad, even after the keyboard was changed to a chiclet layout. The L530 also offers a huge variety of options thanks to the numerous configuration possibilities. This is useful as users will have different price and performance requirements. The notebook’s emissions also remain within an acceptable range even in our well-equipped test device. The only significant weakness is the speakers which were not very satisfying in our test. We found the battery life to be impressive as we surpassed 7 hours in the practical Wi-Fi test with our 9 cell battery. The standard 6 cell battery is likely to also yield impressive performances. 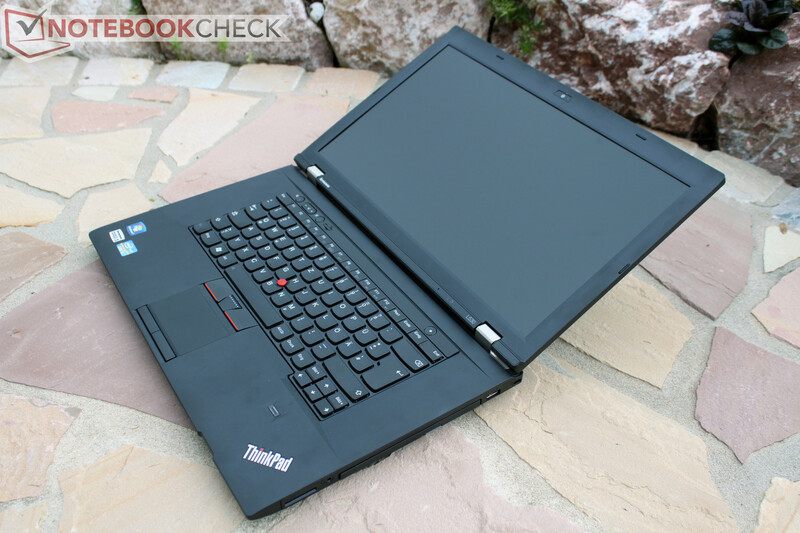 In conclusion, those looking for a full-featured office notebook will find the ThinkPad L530 an appealing option. Based on the configuration, the price of the ThinkPad L530 will be between 730 and 1000 Euro ($890 to $1220 USD), a range we find reasonable considering the results of our tests. The feeling that we are holding a robust and tough workhorse in our hands. The L530 gets dangerously close to its higher-end T530 colleague depending on the configuration. Office experts from all brands - the Dell Vostro 3560, HP ProBook 6570b, the better equipped and higher-end Lenovo ThinkPad T530.